**【Product desciption】** The "Fog Forest" series also introduced new products! 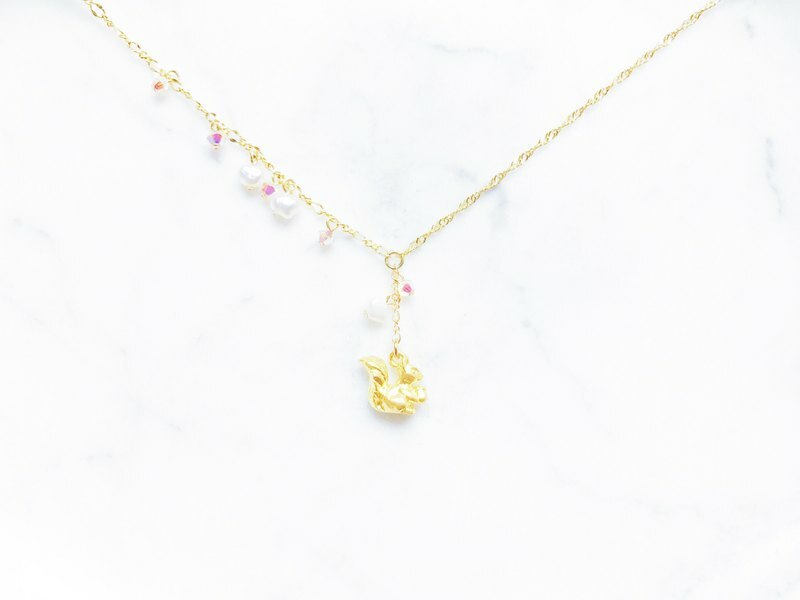 This time, in addition to the super cute forest animals, a mini version was made based on the Y-word chain to create a clavicle chain. The most special is the use of different designs on the left and right sides of the chain, want to break away from the immortal necklace style, this is worth everyone collection! **[product information]** **▲Size** The size of the customer's system is based on demand and there is no adjustment chain. **▲Chain color** Golden **▲ chain width** About 0.15-0.20 cm **▲ Material** ☑ Swarovski crystal enamel with transparent light, non-pink enamel! Freshwater pearls, pearls, jewelry containing pearls are not appropriate to take a bath, prolonged bathing can easily make the pearl surface lose skin light, and even produce cracks. Keep the pearls away from the care chain and cleanliness. Beryllium copper plating K gold / copper alloy gold plating / Japan plating alloy (Gold Plated) ☞**About Gold Plated Material** For depletion jewelry, can not be restored. Plating will produce varying degrees of wear and oxidation depending on personal habits and conditions. The color retention period varies from person to person and may vary from several days to several years. Do not wear sleeping, bathing, swimming, hot springs, maintenance of make-up and other chemical agents, etc. Please avoid contact. If you cannot accept this material property, please do not purchase it. **▲Package** ☑ general packaging (basic beauty / convenient collection) If there is no special purchase and upgrade package, the product will be placed in the same box (bag) after separate packaging. If there is a complete packaging requirement, please note when ordering. ☑ upgrade boxed (gift beautiful/basic collection) ☞ https://www.pinkoi.com/product/1xLDlBvR?category=3 ☞ https://www.pinkoi.com/product/1fR9zBUU?category=3 Whether the product is applicable to purchase and upgrade, please refer to the above link to the store description or use the station letter to inquire, thank you. -------------------------------------------------- ---------------------------- **【Working days】**Please read the number of working days of the merchandise carefully before placing orders. Is it urgent or have any questions about the time of delivery? Please contact us by email. After the order is placed, the notice or remark is urgent and will not be accepted! **▲Product production** The design center's merchandise is custom-ordered, and the number of days worked after the payment is completed (calculated on the first working day after the payment is completed). The goods are hand-made, and the number of working days will vary depending on the production status of the orders. Generally, it takes about 7 to 21 working days (excluding delivery time), and the actual shipping time is the main requirement. ☞ https://www.pinkoi.com/store/laillimitecrea will help you to estimate the current number of days to wait. The announcement waiting time will change at any time depending on the work schedule. **▲Product Delivery** **运送 Taiwan transportation time** By mailing for registration for about 1-2 days, the supermarket will pick up the goods for about 2-3 days, and some of the more distant areas may be delivered for 3-5 days. (Excluding Saturday and National Holidays) **☑ Non-Taiwan transit time** Shipped by**China Post POST airmail**(cannot keep track of the status of the goods), depending on the destination, the number of delivery days is different, roughly 10 - 14 working days after delivery (excluding Saturdays And national holidays). -------------------------------------------------- ---------------------------- **【Precautions】**☞ Please confirm the precautions before purchasing. All products are custom-made products, and we do not provide return and replacement services. In order to avoid future disputes, please be sure to accept another order purchase. **▲ Before ordering** Excluding custom size and packaging requirements, there are any issues or issues that we hope to pay more attention to. **Please don't directly place a message on the order remarks column**, we can't tell you the first time you want to convey Matters, please use the station letter to contact us first. Most of the products in the design shop are too fragile to pull, and you should be irritated to assess your own habits before placing orders. At the same time**please understand the material loss of your order material may occur in the future**, determine to accept the purchase. ☑ If the product is defective at the time of delivery, the condition of the original delivery will not appear until it is worn and used. It will be repaired, and the cost and postage will be charged. If you want to choose a VIP that is very customized, please contact us before using the station letter. If you do not contact us, you may experience delays or disputes due to unclear effects such as size adjustments or inaccurate orders. ☑ Customize the item to be informed or select a custom-made VIP. When ordering, please fill in your desired size (cm) (size includes reserved space) and style . Failure to initiate notification will delay delivery of the product. When you place an order, please pay more attention to whether the address you filled in is correct and whether your name is in line with your identity card (or passport). If for personal reasons (and not limited to incomplete information, inaccurate, or unsolicited receipts, etc. ), resulting in unreceivable circumstances or parcels returned, in addition to the possibility of payment of storage fees or return shipping costs, but also to bear the freight Re-send it. If you can't get in touch with you via a letter or text message, we will save it for you for one month, and you will not be responsible for your custody if you are overdue. For VIPs sent to overseas regions, if the package is returned, it will be handled in the same way as above. If it is not returned to the sending office waiting for authorization correction, we will need to pay an additional NT.50-100 yuan for the cost of the item, in addition to waiting for the correction document to be sent overseas. (including file postage). If you are a VIP who doubts whether or not the product will cause allergies, please do not order. Because everyone has different allergies, there is no way to measure it. ☑ The price of a custom-made product is a floating price and will increase or decrease depending on the price of raw materials. If there is a price fluctuation during the waiting period, the following time-based prices will be the main ones, and pricing will not be accepted or cancelled by other factors. We reserve the right to change prices without prior notice. ----------------------- **▲ After receiving the product** ☑If you have any concerns about size or defects after receiving the product, please do not hesitate to request it within 7 days after you sign it. If it exceeds 7 days, it will not be accepted. It will be listed as maintenance goods to help you do follow-up processing, and you will be charged postage. ☑ If you lose yourself, or if the product is damaged due to other factors after wearing, the defective part is too rough to be repaired. It will not be listed as a repair item and you will have to pay the full cost yourself. ☑ Design Hall merchandise is custom-made, there is no other size for replacement, in addition to some disposable consumables, can be modified, if not our production of negligence (within the license error), need to pay back and forth postage And material costs. Since a small number of products have special materials, styles, or manufacturing methods, they cannot be resized after they are completed, and they may not be repaired after being damaged. ----------------------- **▲About the product itself** ☑ arrangement The products will be slightly adjusted according to the length of the arrangement. The designer reserves the right to adjust the arrangement and proportion of goods. Show In the event that some materials are out of stock or minor part adjustments are made, the designer will retain the right to make adjustments to small parts if the appearance of the impact is not noticed. Length Since the products are all made by hand, there may be dimensional errors (within ±0.5 cm) due to errors in the ruler and the way each person measures. The dimensions provided when ordering are for reference only. Natural stone Each pearl and natural stone has different color depth and texture. Some of them have small cracks or other small flaws such as impurities. They are not as perfect as artificial pearls and gems. There will also be irregularities in the size and shape of natural stone, so there is no way to meet 100% product image. If you cannot accept the above situation, please do not purchase it. Scratch marks Because the product is handmade, the finished product may have hand marks (such as knots or asymmetry, unevenness, etc., does not affect the wearer's situation). There is no way to be as perfect as a machine, so be careful. Color difference All the products in the picture may have a color difference due to factors such as the shooting light or the brightness of the personal computer screen. There may also be a slight drop in the color of different batches of goods.